Not much going on here today! 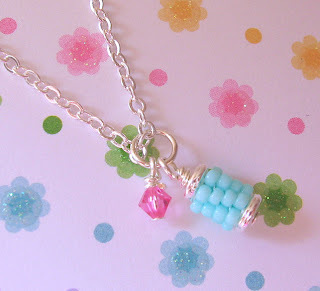 Well, my tiny beaded cupcake bracelet is featured in a great treasury right now! Right now I'm going to go make myself some soup and watch a Christmas movie! Christmas music on the radio, hot chocolate with cinnamon and marshmallows, snow, parties, Santa... *Sigh* It just doesn't get any better! And... Now you can build a gingerbread house the non-messy way! Here's some places online to decorate your very own little Home Sweet Gingerbread home! One of them you print out and glue. The others are click and drag. 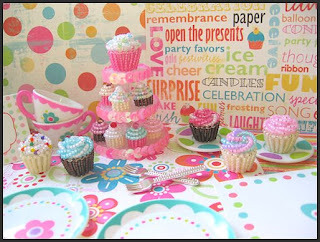 I plan on getting one of those Wilton kits for The Sweetie and I to decorate, too. That will be a fun little project! We had a great little Thanksgiving holiday, despite this annoying little cold that I've picked up. Blah! We did some Christmas shopping, watched movies, had a wonderful Thanksgiving meal, and made it back to Tennessee in one piece! And now I'm off to work on some new ornaments! I hope you all are having a wonderful holiday season so far as well! I know it's not really here yet. But I'm going to be leaving for Ohio tomorrow morning, and most likely will not get another chance to post until next week. (Like I post sooo much now anyway!) Ha! The Sweetie and I are riding up with his mom and sister. We'll be staying with his brother and sister-in-law in their new house tomorrow night, and driving back Friday. I've been hope hope hoping that there would be some real snow up there. But nnnoooo... Sunny both days! Figures! Although I wouldn't want to get stranded either. But since we already had a fabulous Thanksgiving with my family on Saturday, I guess it wouldn't be that bad. Especially since I've already packed some beady things to do. Along with some felt and embroidery floss. (No, I haven't packed any clothes or anything 'important' yet. lol) I'm hoping to get a few little Christmas gifts finished up on the trip. I just have to share... I have had the most inspiring past couple of days. I've even been dreaming about this wonderful project that I have in my head. 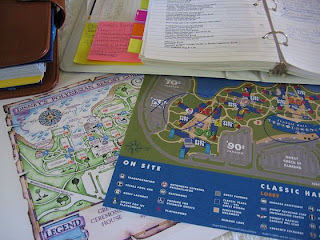 Right now it's still all jumbled up; I need to sit down and get the plans out on paper. But I'm so excited about it! Most of my creations take no more than a few hours. But this... This will be the most involved, most complicated, most beautiful project I've ever attempted. 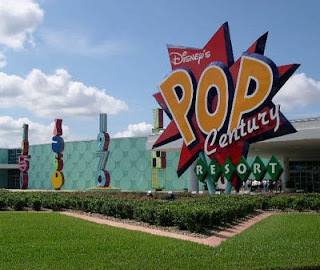 ...We check in at Disney's Pop Century Resort!!! WOOHOO!! I've already got our schedule figured out for the week, for the most part. We'll be there for 7 nights/8 days; taking advantage of the buy 4 get 7 deal. Plus, we get a $200 Gift Card when we check in!!! Hello, World of Disney! lol Since we were already planning on going this winter anyway, the deal worked out perfect for us! 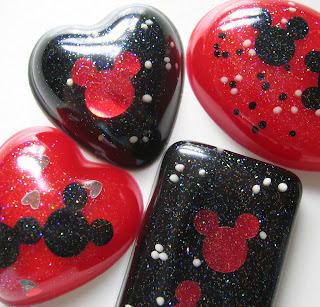 I've already sold about 23 of these guys, so now I have no more black or red Mickey Mouse Confetties! Yipes! It's a good thing I <3 shopping! You guys seem to love them, too! It's the best selling item in my shop! I am always looking for ways to improve them though. That's the warm colors on top, the cool colors in the middle (or the Mermaid colors, as I like to call them. Hehe! ), and the neutrals and mixes at the bottom. So, if you want a cupcake that looks like peanut butter with grape jelly, I have those colors. Minty frosting? I have that color. A pumpkin pie color? No problem. I even have Tiffany Blue! 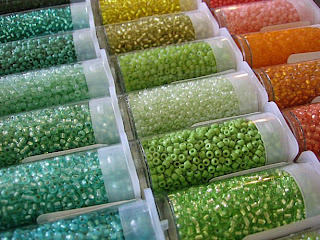 And soon I'll have sterling silver plated beads, and 24K gold lined beads... *sigh* So many possibilities! So remember... 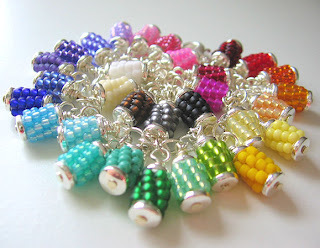 When you are ordering your very own customized beaded cupcake jewelry, don't be shy about special color requests! 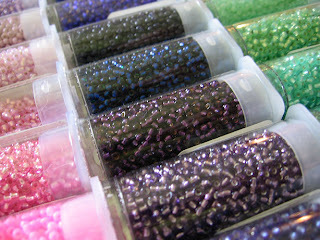 Chances are, I have the perfect flavor for your beaded sweets! I can just go ahead and tell you that this is going to be a very random post! lol I have a lot going on and just wanted to share some quick updates! I just listed these in my shop last night as well. They come scented in Birthday Buttercream! Yum! And you get to customize the colors, glitter, sprinkles, etc. Finish up my last wholesale order! Hmm... It doesn't really seem like all that much when you type it out! Nice! And now I'm off to find some lunch! Hope you all are having a wonderful weekend! I have been so busy over the past month! We also got a new kitten a few weeks ago! Ironically enough... His name is Lollie! lol We thought he was a girl at first... Oops! Speaking of Lollies... 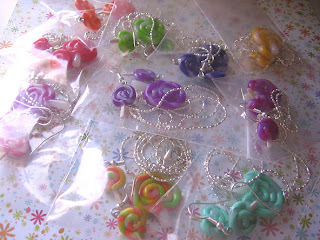 I've also been getting some things ready for LolliShops, working on a few new ideas and mediums for when they open. One of the big things has been working out my own recipe for fiberclay. I think that's finally finished; I just have to make a few things with it to see if I finally like the consistency, etc. 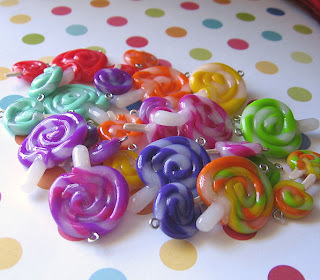 I would also like to have some of those polymer clay lollipop sets up for LolliShops too, but I'm not sure which direction I'm wanting to go right now! The Sweetie has gone out of town a couple of times, which seems to throw everything off. To Florida for a Navy ceremony, and to New York for a Composer's Convention. Thank goodness this is the week of fall break! I can finally get caught up! I'll be sure and reply to any messages, etc. as soon as I can on Monday! All orders will be processed starting Tuesday. Here's a little treat for you all to enjoy while I'm gone! What a lovely, productive week I've had! I finished up a bunch of beaded cupcakes for a local wholesale order. They're in the new Halloween colors, so I'm not going to post pictures of those just yet! Hehe... :D I'm going to wait 'til it gets closer to Halloween! If you would like to order your very own Mini Fairy Lantern Jewelry, please send me a convo through my Etsy shop! And, some other happy news... Everyone's back at work now! I'm so glad! The pneumonia scare is over, and she's back! On a happier note, I did manage to get some new things done this week! 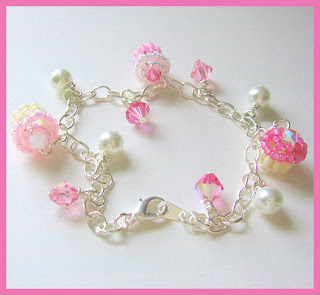 Here is a bracelet that I made using some of the pink, white, and vanilla cupcakes. 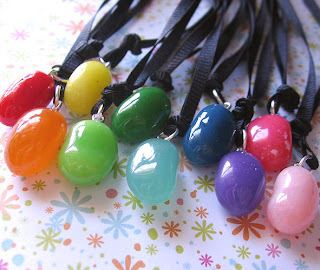 Can't you just imagine this dangling from the wrist of a sweet little birthday girl??? I am just in love with these little sweeties! I have been up to my ears in seed beads this weekend! But, oh how wonderful the results are turning out to be! I'm going to start offering 'Kits and Supplies' in my shop soon, so most of the past week has been spent putting those kits together. 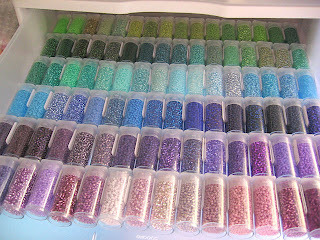 I've really enjoyed the process - choosing awesome seed bead color combinations, picking out the different little odds and ends that will also be included, naming the color schemes... It's been a fun little project! I still need to type up the instructions and finalize the packaging. After that is finished, they will be up in my shop at a special introductory price for the first week! And of course I will sneak peak them here a day or two before they are listed! Meanwhile... I did list some new necklaces today! I am just so excited about our next trip to Disney World! 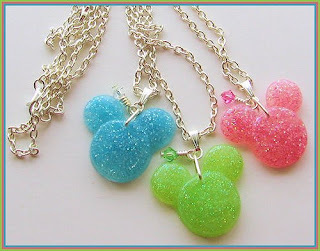 I have one of these little glitter resin MM ears necklaces that I wear quite a bit! I wanted to share them with all of my Disney World-loving friends! And on this happy note... 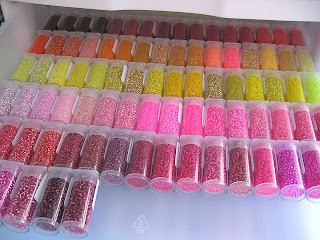 I'm off to mix some more seed beads! I'm so excited to be working another year at the wonderful after school day care that I've been at for six years now!! I just love the other day care workers, the kids, the whole job! However, it is taking me a while to get back in to the swing of things. I'm redoing my schedules to work around the time I am there in the afternoons. And I'm working on getting a nice stock of goodies up for the holidays as well! So if it takes me day or so to get back to you, please don't think I'm ignoring you! I've just got a lot going on right now! I did manage to get something new posted in my shop today! Just look at that new seed bead color! I've had sooo many people tell me that it looks just like Tiffany Blue. So... I've appropriately named it 5th Avenue Blue! Woohoo for Donnell and Justin! In my eyes... They BOTH survived a Japanese game show! By the end of the season, I couldn't decide which one of these guys I wanted to win! I really liked them both! So congratulations Justin and Donnell! I really really really hope there's another season of this show. It was so fun to watch! And sad to see it end! You can come to my tea party if you like! On the menu is peppermint tea, and lots of yummy cupcakes! Oh... So like I was saying... I also have to wait for some new packaging for these cupcakes. These won't fit into my usual packaging, and I want them to have a sturdy way to travel to their new homes! I would also like to find some little plates and doilies to include with each cupcake, but I'm having the worst time finding plain white miniature plates! Anywho... I hope you guys are having a wonderful week so far! I'm off to bead! I can't believe July is pretty much gone already! I must say, I'm looking forward to going back to work at the after school daycare! I'm so excited to see the kids, and hear about the director's trip to Disney World! I believe a few of the kids were going to Disney World as well! Speaking of trips... The Sweetie and I took our own little trip to DollyWood yesterday! Boy was it ever fun! We did remember to take a few pictures! 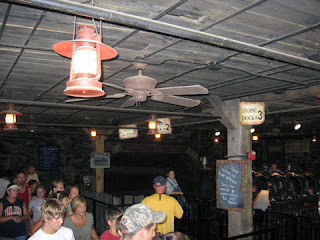 Here's the loading area of Mystery Mine. And you can see the mine shaft that you go down into at the beginning. I always have to go into that shop! And this one is for all my candle making friends out there! Ice Cream Candles! These were sooo awesome! They looked so real! and they smelled delicious! 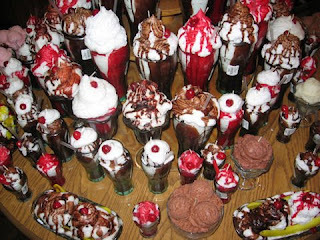 The little floats and sundaes were even in tiny little Coca-Cola glasses. And we got to watch a lady make one! What a wonderful, fun day it was! I've also got some exciting news! I've been invited to be a part of the beautiful LolliShops! I can't even begin to describe all of the wonderfulness that it is going to be! You can check out the LolliShops blog to learn all about it! This is a custom order for someone. I just love the colors she chose! 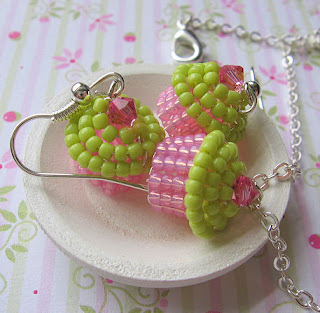 Pink and green is such a pretty color combination! Isn't this just gorgeous??? 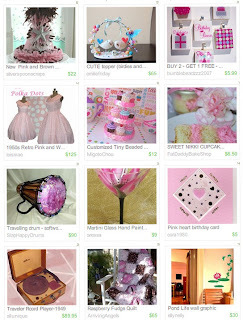 Look at all of the beautiful birthday party treasures! There's even a delicious real Sweet Nikki cupcake from Bangerang Bake Shop listed there next to my tiny little beaded cuppycakes! (Used to be Fat Daddy Bake Shop.) How fun! 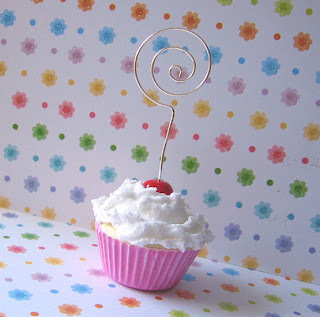 And now with all this cupcake talk, I'm off to find some lunch! Oh, it's not your birthday? That's okay! 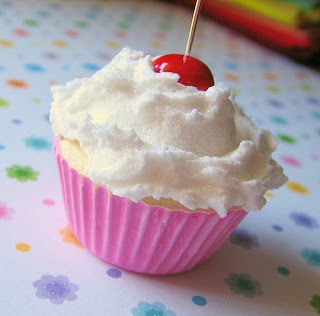 It doesn't have to be your birthday for you to enjoy one of my newest sweet treats! 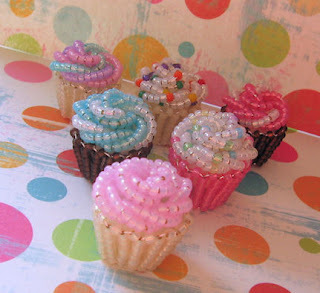 Sweet little beaded Birthday Party Cupcakes! 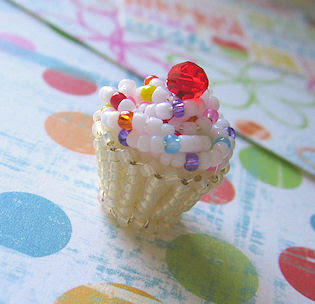 Each tiny little cupcake is just under 1/2" wide, and just over 1/2" tall. They are made from high quality silver wire and glass seed beads. Some are topped with Swarovski crystals, some are topped with pearls. Some are even covered in sprinkles! 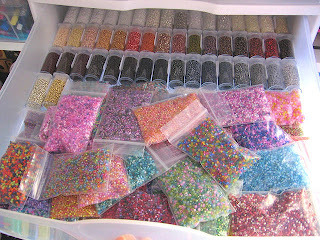 I've always had a huge love for seed beads. There are so many colors, so many possibilities. 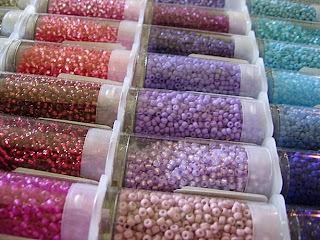 Seed beads are one of those things that I remember spending my allowance on even when I was pretty young. Some things never change I guess! 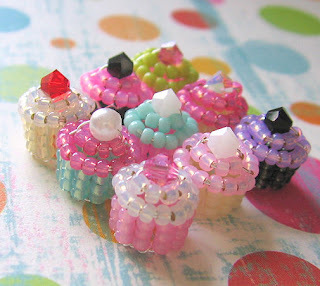 Be on the look out for more beaded bakery treats in the future! 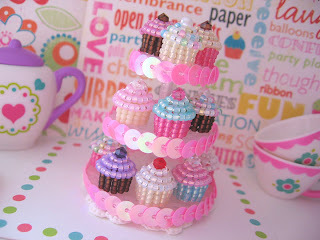 In the meantime, to customize your very own beaded Birthday Cupcake necklace, just visit my shop! Now this has been such a wonderful week! It all started last Friday night when I was on the computer, looking for movie times for Wall E. While I was doing that, I popped into my shop to see how things were going. :D I noticed that one particular item was getting a LOT of views. I jokingly thought to myself, Oh, maybe it's on the front page. I should go look. I giggled at myself, because I never dreamed that I was really on the front page. lol So I go check the front page anyway. AND I'M ON THE FRONT PAGE! I was actually on the front page Friday!!! 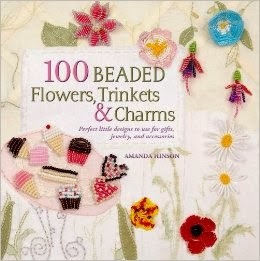 And it is such a beautiful treasury, too! The kind of treasury I've always thought it would be so cool to be in! 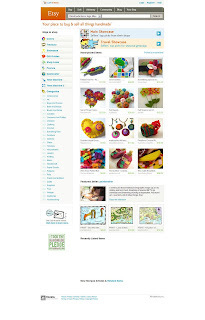 Beautiful bright colors, awesome items... 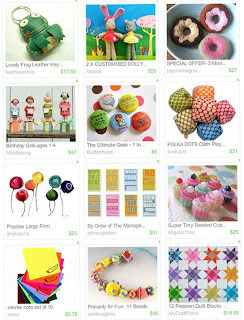 I STILL can't believe I was on the front page of Etsy! 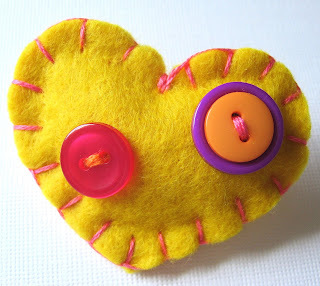 See my little yellow heart brooch there? With all those other gorgeous items? I'm just tickled pink! 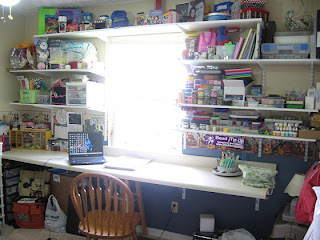 Then on Saturday, my Mom and Dad put some shelves up in the studio. And it looks awesome now! I love it so much! 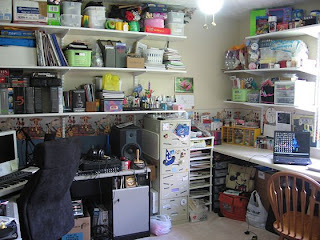 I can have all my things spread out, and I have so much room to work now! Oh, i just love it! We've been talking about doing that for a long time now. I'm so glad to finally have it finished! I also got a hair cut on Monday! I think she cut off about a foot and a half! It feels so much better now. And my curls are super curly now with all that weight off of them! And it's that cool length that you can still put in a cute ponytail, or do all other kinds of neat things to it! I just realized I don't have a new haircut picture! lol I'll get one later! We're also going to get a new kitten soon! We're still looking for the right one. When we find her we'll know! And, in some crafty news... 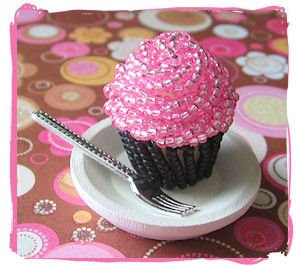 I've been working on a new line of scented beaded cupcakes. They're meant to be like little sculptures, or decorations. Just something cute and fun to have sitting at your desk, or on your party table. I've been working on a beaded cupcake with swirly icing for a while now. I think I really like how this one turned out. I may do a little work on the bottom cake part, but over all I'm quite happy with it! I plan on adding some fun little sprinkles, cherries, and other toppings when they finally go up for sale. Right now I'm just trying to get the shape, and the icing right. I've got some adorable little packaging for them, too! And I've been told that they would make wonderful, unique birthday party favors or gifts! I got my beautiful felt squares from Lupin over on Etsy. They are so gorgeous! Lots of bright cheerful colors to play around with. I highly recommend her felt. It's so soft and pretty. It feels so good to work with. 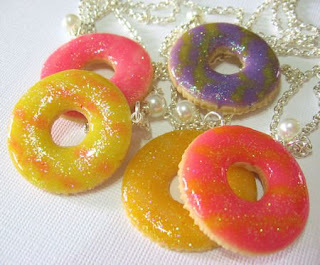 And made some Party Ring necklaces! I read all about them over at their Wikipedia page before starting. I wanted them to look as accurate as possible. 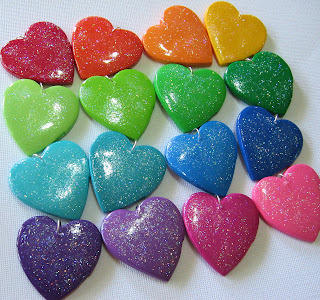 These are made entirely of polymer clay. And glitter, of course. :D Each one measures right at 1 1/8" wide. 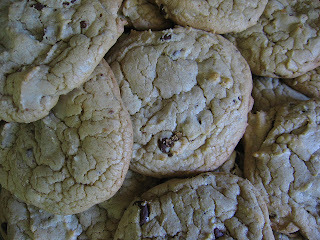 They have been scented to smell like sugar cookies, because I read that the bottom was a lot like a sugar cookie. I turned them all into necklaces. So they are now strung on silver plated chain. And I added a Swarovski pearl to each one, because I thought they looked like they were missing something. And the pearls with the bright colors and glitter look really tea partyish to me. :D And I love tea party things! In other news... I went to a pirate party over the weekend! Arrr! It was wonderful fun. 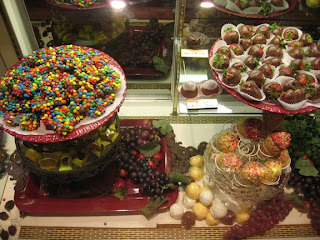 I can't wait 'til The Sweetie and I have kids, so we can have wonderful themed birthday parties, too! Yesterday they were all sculpted, dried, sanded, painted, glazed, and glittered. This morning was spent drilling holes and adding split rings so that I can turn them into necklaces. Then came the pictures! 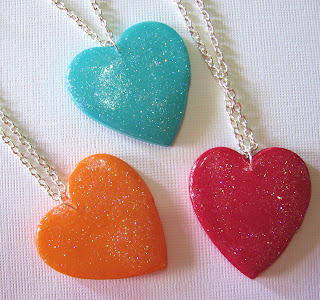 I've already made a few into necklaces, so everyone can see how pretty they are on the silver plated chain! I just love looking at them! They're so glossy and glittery; pictures just to not capture the sparkle of these babies! 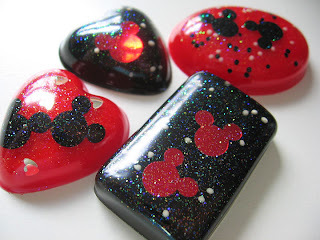 I've got some more ideas for jewelry, too! I'll be working on those over the next couple of days, and should have pictures soon after! Hehe... 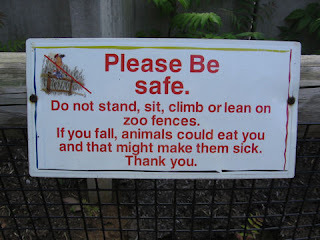 I love this sign! 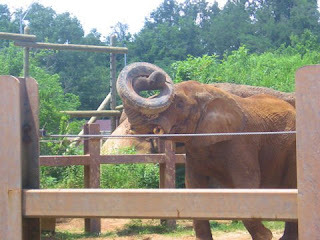 One of the elephants playing with a tire... I think there was food in the tire. 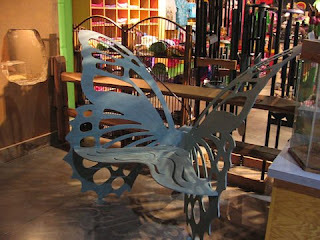 And this super cool butterfly chair in one of the gift shops... I really want one of these for my studio! 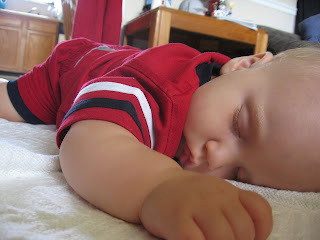 I've also been able to babysit my Sweet Baboo! He's so active now! It's hard to get a good picture of him while he's awake! lol But ohmygosh he's so stinkin' adorable! And so smart! He loves to play, too. He's so much fun to babysit! I've also been to Pigeon Forge for a car show that apparently got canceled! It was still a fun day though! The Sweetie and I have also been able to spend some fun days together. Eating out for lunch, shopping at the used book store, going to movies (The Happening, Zohan...). It's so nice! We ate lunch at our favorite Mexican restaurant a couple of days ago. We had been sitting at our booth for about 15 minutes, just waiting on our food, talking, eating chips and salsa... When the lady across from us said, "You guys are just the cutest couple." I thought that was so sweet! It made me feel all warm and fuzzy. lol I love it when people say things like that! Yesterday I went with my brother to take his pet snake back to the pet store. It was just a little baby, and wouldn't eat anything, and they didn't want it to starve, so they finally gave in and took it back. I had to hold it while he drove. "I'll just wrap it around your wrist; it'll be like a little bracelet." He tells me this after I realize that I'm going to be holding the snake, not the snake in his aquarium. "Yeah, a little bracelet with fangs." It wasn't so bad, and I even got sort of attached to the little guy! As far as creativeness... I've got so many ideas right now, that I don't even know where to begin! I did add a couple of new scented brooches to my shop. Poly Juice Scented - Tropical blend of lemon, coconut, and sweet cream. And these two will be added later. 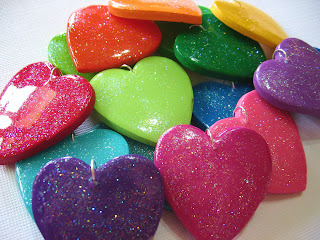 I've got a really cute idea for something similar to these hearts! Still using the heart shapes, and maybe a couple of other shapes. It's going to be a new sort of scented sachet. I'm just waiting to get a couple of things in the mail before I can carry out my sweet, sweet plans! Hehe! But first, I need to grab a quick lunch! Then I'm off to create! I hope you guys are having a wonderful day and wonderful summer, too! If there's one thing I don't like about shopping online, it's having to wait for my goodies to get here! :) I've got 4 or 5 packages of supplies coming this week, and I'm getting so impatient! And I feel sorry for the poor mail lady; she must think I'm stalking her! 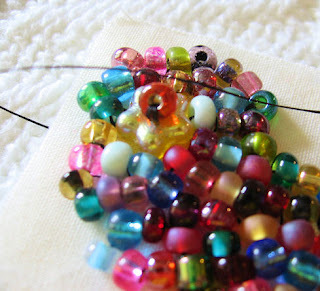 To help with the waiting, I've been working on my bead embroidery. I actually started this back in the winter, but never got around to finishing it during the holiday orders rush. I don't know what it's going to be yet; a brooch or a pendant, or perhaps a hair barrette. I'll have to see how big it is when it's finished. 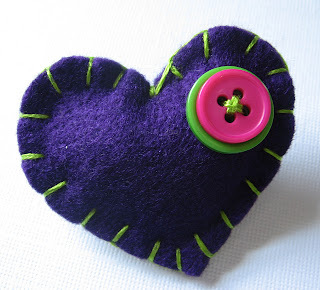 Last night I also started working on some templates for my felt items. You can't see those yet though... Hehe... It would ruin the surprise for the finished items! There's one in particular that I'm really excited about. I've already got the glitter and the felt colors picked out for it! 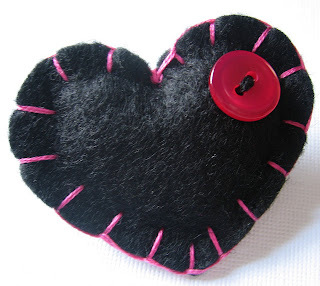 All I need is my felt! 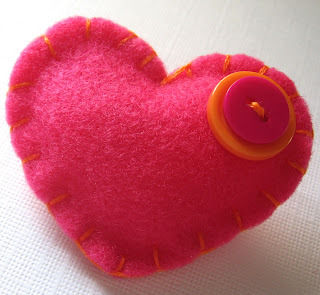 And last, but not least, I worked on some of the scented 'filling' for yet some more felt items! I'm mostly excited about the little scented felt cupcakes idea that I have. I think they will make adorable party favors! As you can see, I really need my felt! Now, I'm off to stalk the mail lady again! Yesterday was a rather cloudy, rainy day. Today has been much sunnier and warm. The Sweetie's parents came over, and we made breakfast for dinner. Hehe... Eggs, bacon, toast, grapes, and orange sweet rolls. While we were waiting for them to get here, I worked on some ideas and sketches of some new felt ideas. 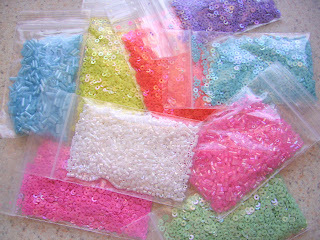 I'm so excited to incorporate some of my seed bead stash into my felt creations! Now I'm off to run some errands!